Happy 2017 everyone! I still can’t believe 2016 is over. So far the new year is treating me good and there are SO many books coming out this year that I’m excited for: King’s Cage, A Court of Wings and Ruin, Etched in Bone….I could really go on and on. Every year though I look forward to the new authors, the new stories and new characters. So this week’s topic is one of my favorites: “Top Ten 2017 Debuts I’m Excited For.” I hadn’t looked into this too much before I started writing today’s topic but let me tell you now there are a ton of great new books by brand new authors coming in 2017. Here are the ten I’m most excited for in order by release date. As always, covers link to Amazon (affiliate) or Goodreads. Frostblood by Elly Blake (Releases Jan. 10): This one comes out next week and it is already being compared to one of my favorite series Red Queen. That is only one of the reasons I can’t wait to read it! The blurb hints at rebellion and paranormal powers too. Empress of a Thousand Skies by Rhoda Belleza (Releases Feb. 7): The cover alone has me drooling! I’m such a sucker for sci-fi, especially those set on a different planet or as in this case in space. There’s a civil war mentioned in the blurb so there’s even a little action. I cannot wait! Wintersong by S. Jae-Jones (Releases Feb. 7): I have been talking about this book for what feels like months now. I cannot wait to dive into it. It’s a loose (very loose) retelling of Labyrinth, one of my favorite movies, and even if it is just a loose retelling I’m still excited. I like the premise of the blurb and can’t wait to see the author’s take on the Troll King. Gilded Cage by Vic James (Release Feb. 17): From the blurb, I feel like this one may be a bit of an alternate historical fiction, but I could be wrong. In this book, there are commoners and aristocrats with magical powers. Commoners serve in the household for 10 years and revolution is on the horizon. If anything, this promises to be an exciting fantasy. Blood Rose Rebellion by Rosalyn Eves (Releases March 28): Another book being compared to Red Queen. This makes me excited and nervous. I LOVE Red Queen so it has big shoes to fill when it is compared. The blurb sounds exciting though. A girl who is exiled because she has no magic and inadvertently becomes the head of a rebellion. Need to read this ASAP! Toward a Secret Sky by Heather Maclean (Release April 4): A girl is orphaned only to find out that her family is a part of a secret, international society who is now trying to recruit her…..yes I need this book ASAP! There’s mention of an otherworldly mercenary too 😀 Ummm….do I need to keep listing the reasons why I’m excited?! Cold Summer by Gwen Cole (Releases May 9): I’ll admit I saw the cover to this one and thought “I want.” BUT then I read the blurb and now I REALLY want! A boy who can’t control his time traveling gift lives his life one day in the present and one day as a soldier in WWII. Girlfriend finds his name on a list of casualties and now it becomes a race against time to stop the inevitable. I’m cannot wait to read this one! The cover for Cold Summer is amazing! Adding it to my goodreads TBR shelf right now. Right?! That’s what drew me at first too. Hope we both enjoy it! 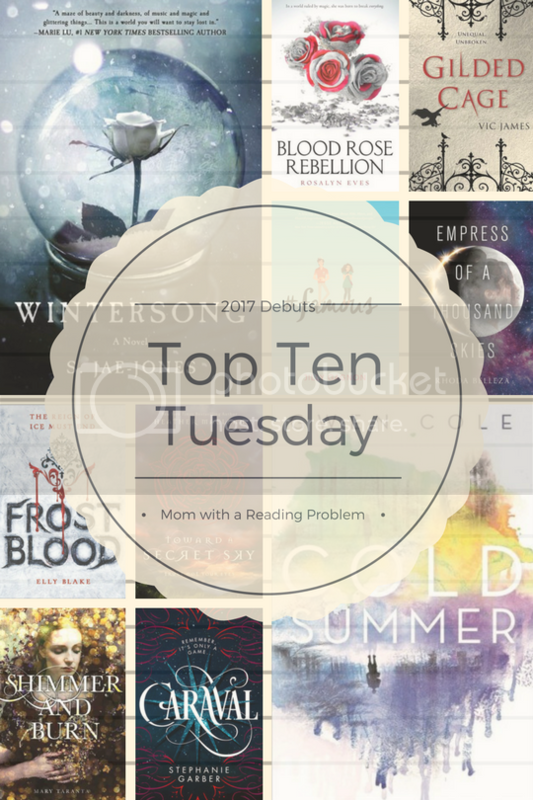 Frostblood, Caraval, Empress of a Thousand Skies, Wintersong, and Blood Rose Rebellion are all wonderful books! I hope you love them as much as I did 😀 I’m also dying to read Cold Summer–it sounds amazing! I’m drawn to Caraval for some reason. It’s like I see it everywhere. Nice list! I’ll definitely check some of these.